Got back my trading card and index card both signed. I sent it out 6/21. 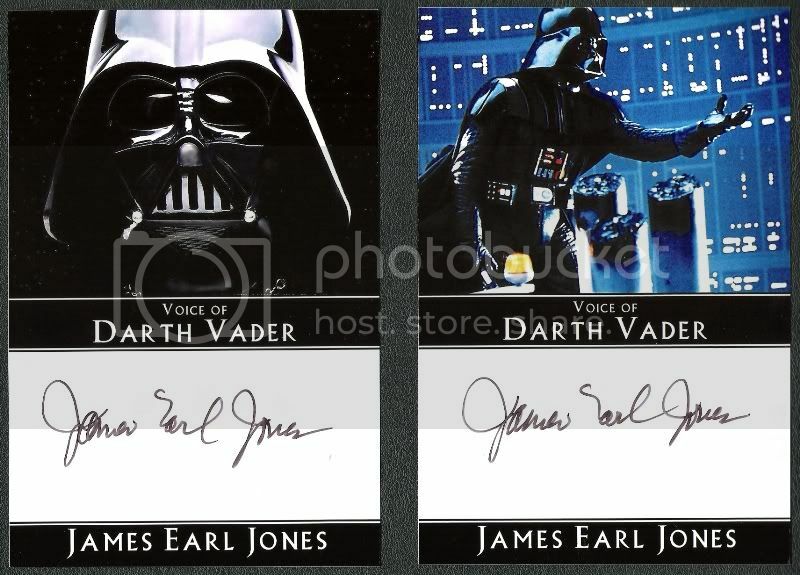 Got an awesome success from James Earl Jones today!! He signed all five of my 4x6 photos!! I was really surprised at how short it took for a reply compared to the other fans that sent him letters, Only 35 days!! He did use my SASE. Thanks so much Mr. Jones!! Nice success, jedicouncil! When did you send it out, recently? Or were you waiting months like the rest of the guys? A great success today from Mr.Jones. He signed my already signed 10x8 and a widevision card. This took just over 3 months from the UK. If only it had arrived 3 days earlier I could have taken it to Celebration Europe and had Billy Dee complete it. Can't complain though, it looks great! 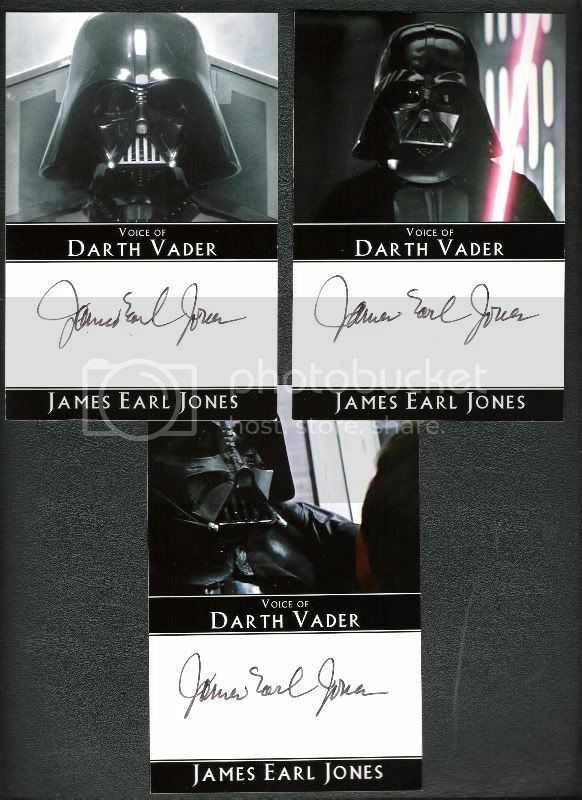 It looks like Mr. Jones has had a busy few days signing as lots of people have been receiving autos back. I'm very pleased with this one and I'm sure i'll have the opportunity to add Billy Dee in the future. I sent Mr. Jones a pic on 8/17 that I'm hoping to get back and take to the Star Wars Fan Days in October (Plano, Texas) to get signed by Mr. Prowse and Mr. Bulloch. It's the cloud city pic with Lando as well so it would be awesome to meet Billy Dee some day. WOW! Very cool success! HA! I wonder if he caught his mistake after he signed it. I wonder if that's rare. You could stick it on Ebay and sell it for $10,000 dollars Just kidding! 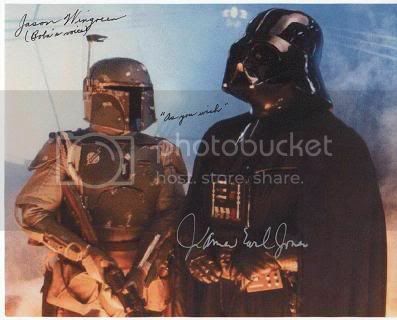 "Thank you for your recent request for autographed materials from James Earl Jones. Due to an overwhelming work schedule he will not be available to sign any such items at least until after July 1st. He appreciates your understanding." A little disapointing but he must get so many requests, to which he always replies! At least he still wants to sign later in the year, top man! My photos were returned along with my IRC's. Ah Man! I'm sorry Matt. At least they returned your IRC's. Hopefully you'll be able to get them signed after July 1st. I will make sure and give you feedback! On my second try using the normal address I got a success! 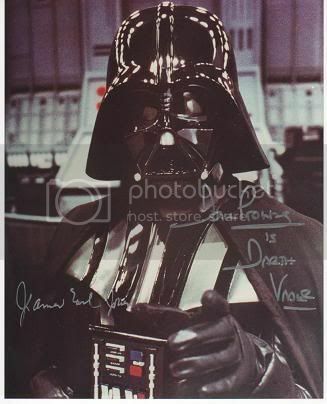 So Happy as I really wanted Mr Jones to sign my Darth Vader pictures. 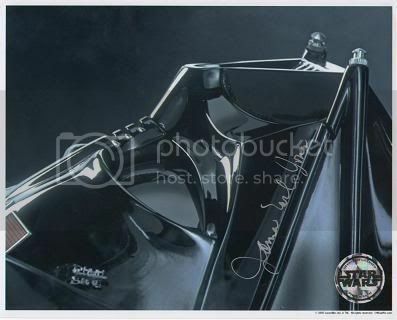 I might try later on for a signutre on a Boba Fett/Vader Pic I have both the Vader guys on. My request only took 11 days! The normal address? Through his agency? Still I wouldn't recommend we all start doing 2nd trys also it might annoy him. Those look fantastic Wes!! James is so awesome!! I meant later on as in months away!